HATEOAS is a constraint of the REST application architecture which is very often ignored by developers. In many cases this is caused by the lack of support of frameworks used to build and expose RESTful services. 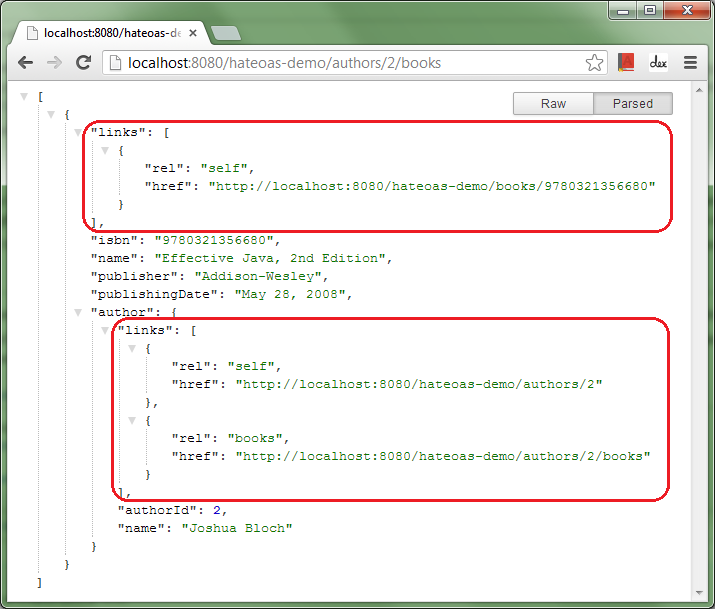 In this post I will show how quickly we can add HATEOAS to RESTful web services using Spring Framework. Source code of the demo web application presented below are available for download, run it using mvn tomcat7:run command. Also you can read a nice presentation about why HATEOAS is important. The Link value object follows the Atom link definition and consists of a rel and an href attribute. The builder inspects the given controller class for its root mapping and it frees developer from ugly manual string concatenation code (protocol, hostname, port, servlet base, etc.). Yes, you can test them using MockMvc also. We are using MockMvc in our integration tests and RestTemplate in our acceptance tests. Nice article. Very clear and concise. Look forward to trying your example. nice job! simple and to the point. I read your article.Its clean and precise. I have a question in connection to this. I am able to get the above output without the actions. Can i get that actions inserted in the output without creating an actions object.